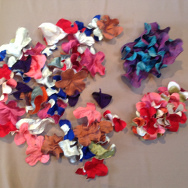 We love making our own flowers and they can be made in many different colours and fabrics. We will show you how to make two types of flowers ? one shaped with traditional French flower making tools, the other using free form shaping. Bring a variety of silks if you have them. Silk dupion works very well as does habitae (silk lining). Bring some different colours that go well together so we can mix things up a bit. All the tools you will need: French flower making tools, irons, dolly heads, wire cutters, pliers, sewing needles, thread, scissors, sewing machines, blocks, etc. Any of the workshop materials will be available for purchase should you need them. Let us know in advance if possible. Make a beautiful, elegant flower as a trim for a hat or on its own as a headpiece.